A bigger, plummy wrap version of the woven stitch cowl – I just need to get some decent photos and I can release the pattern! For this one I used super squishy Tanis Fiber Arts DK in plum, and some Fleece Artist Woolie Silk 3ply for the silver. how did you achieve that lovely purple dash? i quite like it. I would love to see your version of a sweater dress! I am avidly pro-“ambitious, out of the ordinary” projects. I wouldn’t say no to knitting a dress, and I’ve been eagerly awaiting the right time to start knitting up some PJ pants. Who wouldn’t want soft wool pants when it’s cold? Come on! 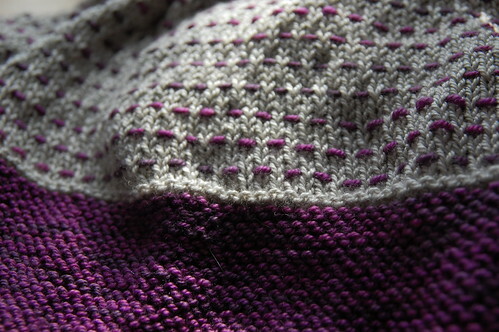 Ooooh, I love the woven stitch in this color combo! I’ve been dreaming of sweater dresses, too. Not sure if I’ll ever follow through, but the idea of having a warm wooly dress to wear in the wintertime is pretty tempting. Beautiful! and you know, I’ve been hankering for a knitted dress too. I designed one for my daughter for her Bat Mitzvah. (You can look it up on Ravelry under my projects) Now I think it’s time for one for me. Can’t wait to see what you come up with. Ahh…I love this color combination. Can’t wait to see the FO! I love that purple. It’s wonderfully vibrant! I’ve always wanted to knit a sweater dress but I know it would take me forever. I really want a sweater dress, too!! I can pinpoint the cause of my desire, though. I love the purple broken lines across the field of silver. Mmmmm. Loving the purple , you/re really wetting my appetite for this patten. I have been saving some local organic handspun for a project. But I’m not sure how it would look. The uniformity of the yarn does play a huge part in this pattern. Oh man, if you figure out a good yarn to us for a sweater dress, I’d love to see the results!